Measured in statistics most of you will have results that are only 20% worse than the best in the game when you are Putting from 4 feet. Take that out to 6 feet and the deterioration in the performance comparison between you and a Tour Professional is only slight. But in the 6 – 15 foot range the difference, in the number of Putts sunk, between you and the world’s best becomes quite marked. 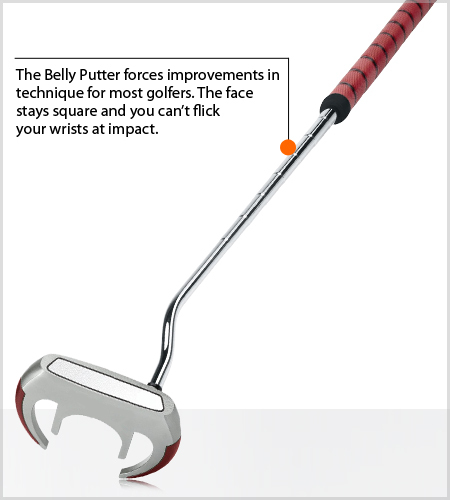 The ‘Belly Putter’ has attracted a lot of controversy amongst the Tour Professionals but, used properly, it will improve the performance of most amateur golfers in the 4 – 15 foot range. Pick one up, take a posture with the Putter ‘attached’ to your body and then take a practice stroke (without a ball) paying careful attention to the Putter face. It will stay square through the stroke. It is very difficult, if the Putter is attached to your stomach, to open and close the club face. To do that it would have to twist in your shirt. For most amateur golfers with a traditional Putter, the challenge on a Putt less than 15 feet (if they have read the green properly) is squaring the club face at impact on the correct line. From putts over 30 feet though, most amateur golfers perform worse with a Belly Putter than they do with a traditional Putter. The reason is that they have, over the years, developed some sort of distance control based on hitting the ball with their wrists. Again the Belly Putter doesn’t allow that ‘flaw’ into your game. With putter ‘attached’, you can’t flick at the ball. One route to better Putting, whether you want a Belly Putter or not, is to improve your technique so that the Putter face is square, moving down the correct line at impact. Next time you are on the Putting green spend some time on a flat surface, with putts from 10 feet, practicing your line and face position impact. Set yourself a goal to get closer, in the 6 – 15 foot range, to the top Tour Professionals. You can all do it. IS YOUR AVERAGE LENGTH LESS THAN 20 YARDS? Which of the following three options will give you the quickest, and highest chance of improvement in 2012? c) tool up and add to your skills so that you can get up and down in 2 more often, and never more than 3? a reduction in either scores or the average handicap. by the games regulators have all conspired to make the short-game more difficult. You should take charge of your short-game. What is your average score when you are in the 50 – 90 yard range? What can you do to improve it? Play better golf. Improve your short-game. This entry was posted in golf, golf instruction, golf tips, sports, Uncategorized. Bookmark the permalink.